Who am I? Where did it happen? Who said it? Where is it on the map? Your child will enjoy demonstrating his history knowledge as he uses the clues to identify the answers. Discussion questions encourage him to provide explanations in good sentences. The 14 tests (including 4 nine-weeks examinations) and 29 quizzes included in this book are correlated with the texts The History of Our United States in Christian Perspective, 4th ed. ; My State Notebook, 3rd ed. ; The History of Our United States Geography/Maps and Reviews; and the Home School History and Geography 4 Curriculum/Lesson Plans. The curriculum provides sample questions to guide the parent in preparing six quizzes and two tests over facts about his own state from the My State Notebook. The Test 13 nine-weeks examination includes twenty questions over chapters 13 and 14 of the history text, allowing the parent to fill the rest of the exam with review questions over his state’s history. 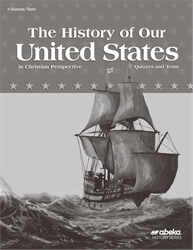 Answers and grading guidance for the quiz and test book are sold separately in The History of Our United States in Christian Perspective Teacher Quiz/Test Key. Grade 4.